The zero-day memory corruption flaw resides in the implementation of the SMB (server message block) network file sharing protocol that could allow a remote, unauthenticated attacker to crash systems with denial of service attack, which would then open them to more possible attacks. According to US-CERT, the vulnerability could also be exploited to execute arbitrary code with Windows kernel privileges on vulnerable systems, but this has not been confirmed right now by Microsoft. However, the proof-of-concept exploit code, Win10.py, has already been released publicly for Windows 10 by security researcher Laurent Gaffie and does not require targets to use a browser. 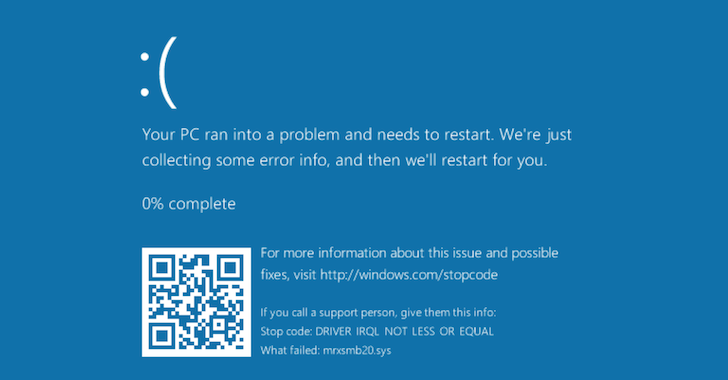 The memory corruption flaw resides in the manner in which Windows handles SMB traffic that could be exploited by attackers; all they need is tricking victims to connect to a malicious SMB server, which could be easily done using clever social engineering tricks. Since the exploit code is now publicly available to everyone and there is no official patch from Microsoft, all Windows users are left open to potential attacks at this time. Until Microsoft patches the memory corruption flaw (most probably in the upcoming Windows update or out-of-band patch), Windows users can temporarily fix the issue by blocking outbound SMB connections (TCP ports 139 and 445 and UDP ports 137 and 138) from the local network to the WAN. The vulnerability has been given Common Vulnerability Scoring System (CVSS) score of 7.8. Proof-of-concept code has been published on GitHub.